This entry was posted in That's quite interesting. Bookmark the permalink. So, you will only fix your Mom’s computer. Not your Dad’s and certainly not your Uncle’s. Well, at least my DVR works on two channels at the same time. Maybe you should start your own cable company. You know, if Fire Departments work like IT service, we would all be siting around in a pile of ashes. Hahaha, its mostly for people who call me at 7 in the morning to wake me up to say their lives are going to end because they lost some emails and don’t know how to get them back. I tell them NO, I can’t come by right now, I have things to do, and they insist. Finally, I tell them flat out NO!!!! 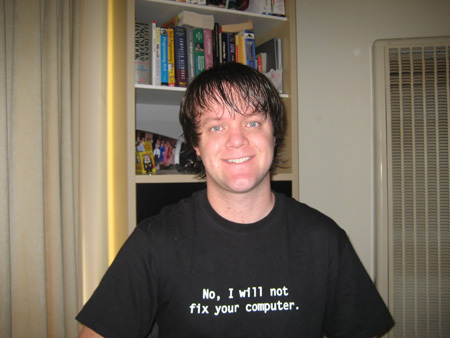 I will not fix your computer. Especially, since the only reason for him to ever call is because his computer doesn’t work. Firefighters, on the other-hand, deserve help. My TiVo does record 2 channels at once right now, even without the cable cards, just need those for Digital channels. Any way for 911 to not put me on hold for 10-15 minutes when its raining outside when I’m trying to report an emergency? You guys have a special number to call? Answer me that and you got yourself some tech support.